The natural gas deposit at Diamond is said to be significant and government has been asked to decide on whether the resource should be exploited commercially for the benefit of that East Bank Demerara area. Director-General of the Civil Defence Commission, Lt.Col. Kester Craig said a sample of the methane gas was sent overseas to determine the quantity and potential, which initial tests reveal is in significant amounts. He was quoted by government’s Department of Public Information as saying that several recommendations were received including the placement of a gas generator to provide electricity to the community or having a private investor collect the gas for commercial distribution. Following a complete assessment, a report will be submitted to Minister of State, Joseph Harmon for an executive decision to be made in this regard. 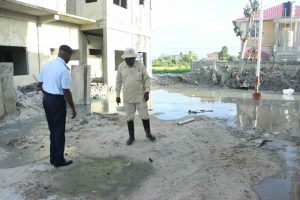 The well at Sixth Street, Diamond, East Bank of Demerara on Wednesday erupted in the early morning hours spewing debris up to 50 feet in the air, consisting of mud, water, gas and small boulders on nearby houses. The eruption of the well occurred around 01:30hrs, immediately following, the 24-hour National Emergency Operation Centre was contacted and a team dispatched to the location. Officials from the CDC, Guyana Geology and Mines Commission (GGMC), the Guyana Police Force (GPF) and the Guyana Fire Service (GFS) were on the ground monitoring the situation. Lt. Col. Craig sai that about two weeks ago engineers from the GGMC completed the initial capping. This process entails what is known as “reverse welling” and involves the use of two sets of pipes, which are placed about 25 feet below the ground to trap the gas at the surface, “it involves using cement to seal around the pipes and the affected areas,” Craig noted. From the assessment conducted this morning by Senior Petroleum Technologist, GGMC Mitchell Prince, it was determined that an apparatus would have to be set up to capture the combination of gas, mud and water and then separate the gas from the mixture. An assessment was also conducted by the Environmental Protection Agency (EPA) and Massy, which ruled out the presence of excess amounts of methane gas in the atmosphere. Craig is also urging citizens to refrain from drilling wells without permission from the Hydromet Office to avoid a similar situation, which has resulted in significant losses. He disclosed that authorities are currently reviewing the laws to ascertain possible sanctions for the homeowner responsible for the eruption in June after he claimed to have been digging a domestic water well. Nearby residents were assured that the situation is under control and a solution forthcoming following assessment.